Horizon Dental Care 13th Annual “Dentistry from the Heart” Dr. John Evanish III, President and CEO, Horizon Dental Care and some of the over 75 “Dentistry from the Heart” event volunteers pose for a photo outside the Horizon Dental Care Hawley Office. On Saturday, April 21, 2018 volunteer dentists, hygienists, assistants, dental office staff donated their time and expertise to help provide dental cleanings, fillings and extractions completely free of charge to those in who could not otherwise afford it. HAWLEY, PA – February 6, 2019 – On Saturday, April 27th from 8:00am until 2:30pm, Horizon Dental Care will host the 14th Annual Dentistry from the Heart Event at their Hawley Office, located on Route 6 in Hawley, PA. The event provides free dentistry including fillings, cleanings, and extractions at no cost to patients in need. During the past 13 years at these events, Dr. John Evanish III and his Horizon Dental Care team of doctors and dental professionals along with a dedicated group of local volunteers have provided over a million dollars in treatment completely free of charge to nearly 3000 adults who could not otherwise afford dental care. Why Dentistry from the Heart Matters…. For many individuals throughout Northeastern Pennsylvania there are limitations to getting affordable dental care. Many “working poor” are under-insured or have no insurance at all. Due to shifting policies and changing demographics in the area, the percentage of residents with dental decay and tooth loss is high and the number of dentists who accept medical assistance is low. As a result of these factors, far too many patients who lack dental insurance suffer until they end up in emergency rooms for treatment to manage pain and infection. The condition of the oral cavity matters because it is interconnected with general health, social function, and emotional well-being. 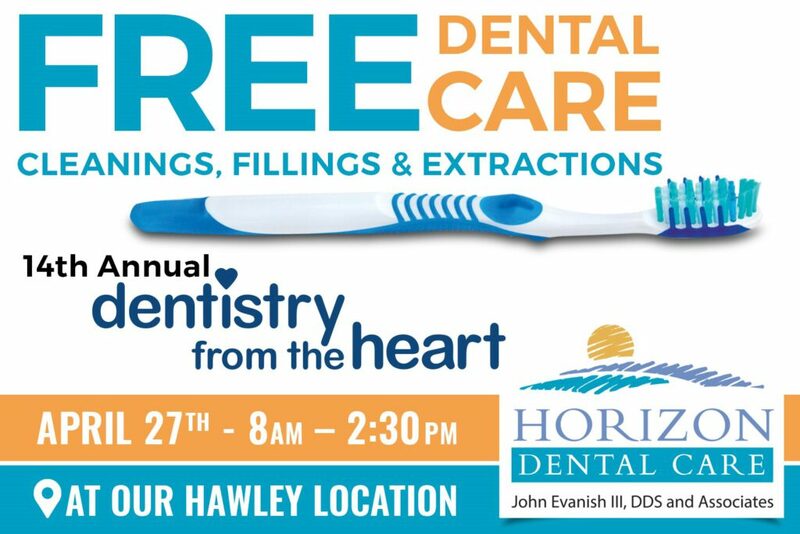 Horizon Dental Care’s annual “Dentistry from the Heart” Events seek to remove barriers to quality dental care by giving people the opportunity for a free teeth cleaning, and when required, fillings or extractions to help to restore better health and alleviate discomfort. Event registration begins promptly at 8:00. Patients MUST be at least 18 years of age to receive treatment. Adult patients will be seen on a first-come, first-serve basis. For over two decades, Horizon Dental Care has set the standard for personalized, worry-free dentistry. From an emergency tooth repair to a routine cleaning, our staff of nine doctors and over sixty dental care professionals are focused on making sure our patients receive exceptional service, caring support and individualized treatments that will make their dental experience comfortable and relaxed. 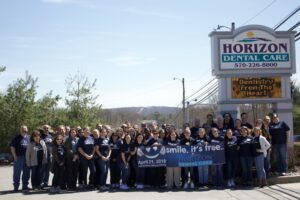 With three, convenient, full service dental offices Horizon Dental Care serves patients in the Scranton, Hawley and Honesdale. New patients are always welcome. To schedule a free consultation and new patient exam visit www.horizondentalcares.com.